2013 Bobcat S770 skid steer loader, hand/foot controls, cab with heat/AC, radio, 2-speed, low range up to 7.1 mph, high range up to 12.3 mph, 7-pin electric multifunction, 23.0 GPM standard flow auxiliary hydraulics, case drain coupler, 92 hp Kubota V3800-D1-TE3 tier 3 diesel engine (no DEF), Bob-tach quick-tach plate, 3,350 lb. rated operating capacity, no bucket, choice of set of four 255/70R22.5 snow tires (not shown in photos) or set of four 12.00-16.5 12-ply Bobcat-brand tires, only 273.6 actual one-owner hours. Can't tell from new. 2005 New Holland LS190.B large frame skid steer loader, 21 gpm standard flow hydraulics, 80 hp 4 cylinder 274 cubic inch diesel engine, 2,800 lb. SAE lift capacity, cab with heat/AC, 2 speed, mechanical controls, rear weight package, set of four new 14X17.5 Galaxy Beefy Baby tires with rim guards, hydraulic bucket Q-tach plate, 84" low profile bucket with bolt-on cutting edge, original paint except for paint touchup on weight package, 1,792 actual hours. Serviced through shop. 2003 New Holland LS180 SSL, auxiliary hydraulics, hand/foot controls, two speed, enclosed cab with heat/defroster, engine block heater, like-new 12-16.5 tires, suspension seat, counter weight package, hydraulic quick tach plate, horn, turn signals, 72" bucket with bolt-on cutting edge, 3,087 one-owner actual hours (has original seat cushions). Serviced through shop. 2002 New Holland LS170 skid steer loader, 10-16.5 tires @ 50%, enclosed cab with heater, hand/foot controls, original seat, auxiliary hydraulics, like-new 72" bucket with bolt-on cutting edge, 3,283 actual hours. Serviced through shop. 1995 New Holland LX465 skid steer loader, 30 hp diesel engine, 10.00X16.5 tires @ 40%, hand/foot controls, cab heater, side windows, 60" bucket. One owner with 1,172 actual hours. All original, including paint. 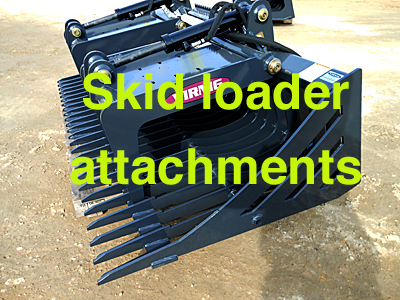 We have a large variety of attachments for your skid loader, including pallet forks, bale spears, rock buckets, grapple buckets and snow blades. We have snowblowers, snowblades, pickup brooms and angle brooms for your skid loader.